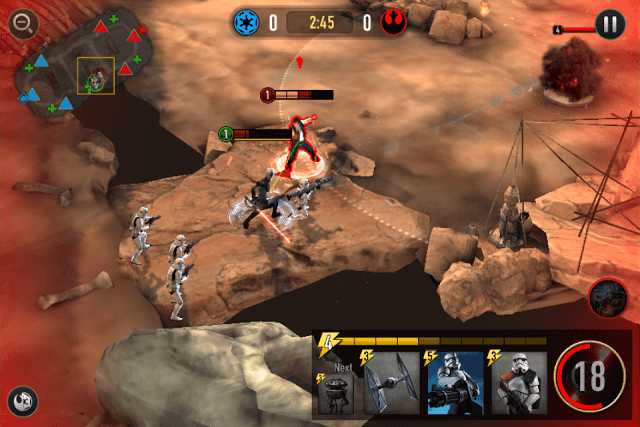 Star Wars Force Arena combines fast-paced MOBA with card-battling elements and delivers satisfying gameplay experience. This pocket-sized multiplayer online battle arena lets you fight human players in real-time PvP battles. You will be building decks consisting of squad and support cards, choose your favorite Star Wars character (there are sixty iconic characters!) and deploy them into an arena to destroy your opponent’s turrets and the all-important shield generator. You can choose either Rebel Alliance or Empire. Whichever side you will chose, you will get rewards upon winning a PvP arena battle. You win if you destroy the enemy shield generator before time runs out. Destroy the enemy shield generator before your opponent does. Your opponent’s shield generator is protected by three defense turrets. One turret is positioned in front of the shield generator. The enemy shield generator is then flanked by two more turrets which automatically attack anything that come within their range. Destroying a turret will give you 1 objective point. You can still win a match if you don’t destroy the enemy shield generator, but earn more objective points than your opponent before the timer hits zero. So if you destroy two turrets and your opponent destroys only one and the time runs out, you win! You will have to deploy units to target turrets/incoming enemies. When the game starts, your first objective is to destroy one of the frontline turrets so that you can occupy a major part of enemy territory. The “red area” around a turret will disappear soon after the destruction of a turret. You can then deploy ranged units deep into enemy lines to target the turret placed in front of the shield generator. Every card costs energy. The number at the upper left corner of a card shows the energy cost needed to use it. Just above the cards section is the energy bar which decreases cell by cell when a card is deployed into the arena. It has a total of 10 cells. So if you drop a squad card that costs 2 energy, two cells will disappear from the energy bar and only 8 cells will remain. Don’t worry as the energy bar refills 1 energy cell every 3 seconds. 3 cards are randomly drawn from your deck. These battle-ready cards can be deployed into the arena. You can drag these 3 cards into the arena, but keep a tab on the energy required and the remaining energy cells. You can also see what card will be drawn next in the “Next” section. Your leader “dies” if his HP (green bar above him) hits 0. But don’t worry, he will respawn and it will take a few seconds before he reappears in front of your shield generator. Units deployed when he was alive and fighting will continue their fight until they are defeated by the enemy units/leader. You can again deploy units soon after your leader appears. The map at the upper left corner of the screen shows the position of all turrets as well as shield generators of both players. It also shows enemy movement. Those green plus signs are med kits. Moving your leader towards these glowing med kits will restore some of his HP. Battle takes place between two different factions. So if you choose a leader from the Rebel Alliance, you will face a Galactic Empire leader in a 1 vs. 1 battle. As you already know, your victory objective is to destroy enemy’s shield generator and even if you cannot destroy there are always objective points you can earn by bringing down enemy turrets. To demolish turrets quickly, you should add those units that target “structures”. Such units will decrease a turret’s HP faster than anyone else can. You should have such cards that deal more damage to structures in your deck. To check which card deal structure damage, go to your deck, tap a card and check the “Target” section under “Battle Info”. Example: Rocket Stormtroopers target “Structures”. Vehicles can also deal massive damage to turrets and because of their high HP they can’t be destroyed easily. Create a deck with one or two vehicle cards and make sure you deploy a vehicle early when it appears in the available cards section at the lower right corner of the screen. Protecting one of your turrets instead of going all out attack to target enemy turrets might be a good idea because once you have killed the enemy leader and destroyed his units while defending, you will have some extra time to attack his turrets. Do remember that your turrets also start attacking anyone that comes within their range so it will be your squad units + leader+ turret against the enemy leader and squad. Target the enemy leader first as your turret prioritizes attacking squad units over leader units. When enemy leader is killed, he will spawn in front of his shield generator. It will take a few seconds for him to appear in front of his shield generator, plus it will take a few more seconds to deploy units and arrive at the designated spot. Also remember that your opponent cannot deploy additional units until his dead leader has respawned. The slight delay in respawning and deploying more units will give you enough time to march towards the enemy turret and destroy it. What you should do is check enemy movement to know which lane chooses to attack your turrets. Look at the map at the upper left corner of the screen to know which lane (left or right) the enemy leader chooses. If the leader chooses to target the turret on the left, then quickly move your leader close to the left turret and deploy units in front of it. Use your best cards when defending a turret. You can drop vehicles plus you may also use support cards to deal AOE damage to a group of enemies. I use the “defend first” strategy to give a tough time to my opponents. You can try it in training mode first before playing the 1 vs. 1 match. Ranged units like Rocket Stormtroopers, TK-7193, Death Squad Leader, Rebel Pathfinders, Gigoran Rebel, Chirrut Imwe, and Dressellian Sniper are some examples of ranged squad units that can be very helpful in attacking from a distance. You can also use them to attack turrets. Make sure to check their advantages and disadvantages over enemy units before deploying them. Besides “Leader” cards, there are Squad and Support cards in Star Wars: Force Arena. Almost all support cards deal AoE damage i.e. deal damage to a group of enemies. Squad cards can be further classified as ranged, melee, vehicles. Squad units with an “Attack Range” of 7 or more attack can be categorized under “ranged” units and can attack from a fair distance. If you want to add ranged units to your deck, then tap a card and check its “attack range”. Before adding a card, check its rarity. Based on rarity, cards can be divided into Legendary, Epic, Rare, Unique and Common. Legendary cards are the rarest of them all and leaders usually fall under this category. Such cards have a black background. Epic cards have a purple background and can’t be found easily. Try not to trade them for a unique card in the “Trade” section. Chances of getting a rare card are more than an epic card. A rare card has a blue background. Common cards have a grey background. Unique cards are leader-dependent and have an orange background. You can add a unique card to your deck when you have selected the leader which is tied to it. For example: You can use Imperial Royal Guards, when your leader is Emperor Palpatine. Destroying the enemy turret before your opponent will only will boost your morale, but also let you infiltrate deeper into enemy base. When you attack a frontline turret, command both squad units and your leader unit to target it. Turrets will target squad units first instead of the leader unit. So while a turret is busy attacking squad units, command your leader to keep attacking the enemy turret. Use his special skill to deal more damage to it. Send vehicles and squad units that target structures. Rocket Stormtroopers can be a very good bet against turrets. They will attack turrets from a distance. If you have chosen Rebel Alliance, then don’t forget to drop Dressellian Rebel Warrior. It has a long range, can take down Tie Fighters and can be used to target a turret from a distance. Collect play points to unlock “Play Pack. You will get 3 play points if you win a match, 2 for a draw and 1 for a defeat. You can open a play pack after collecting 10 play points. Free packs are available every 4 hours. A free pack may or may not contain crystals. Packs that have crystals drawn at the lower bottom may contain gems. You will get a victory pack after every win. But it takes time to unlock a victory pack. It will take at least 3 hours to unlock one. To unlock a victory pack, tap it and press the orange “unlock” button. After 3 hours, tap the “Open” button to unwrap a victory card pack. You may also receive cards after completing missions. The mission screen can be accessed by tapping the checklist icon located just beside the gear icon on the upper right corner of the screen. There are two types of missions: Basic and Special. Completing a set of basic mission will unlock a card (could be legendary). Completing a set of special missions will unlock a card pack. You may get credits, gems and even a random card after completing a solo mission. Missions are nothing but simple tasks that need to be completed. Example: Upgrade a Total of 2 Cards, win a 1 vs. 1 or 2 vs. 2 match 1 time etc. Each card has an advantage and disadvantage over an enemy faction’s card. For example: Rebel Troopers are strong against the empire’s Rocket Stormtroopers, AT-ST Walker and Probe Droid but weak against Sandtrooper, Tie Fighters, Stun Grenade and Imperial Laser Turret. To know a card’s strength and weakness: tap “Deck”, tap a leader and then tap a card. Tap the “Advantages” tab to find out that card’s strength and weaknesses. The card will be strong or weak against certain units of the opposing faction. Upgrading a card boosts stats. Upgrading squad cards boosts their 3 main attributes: Health, Attack Power and Damage per Second. Upgrading support cards such as X-wing and Tie Fighter boosts the leader or squad attack power and turret attack power. Upgrading support cards that stay for some time and slow down speed, trap enemies etc. will increase their duration. The cards you receive from free packs, victory packs etc. require a certain number of duplicate cards to be upgraded. So keep opening card packs to get duplicate cards. Once the requirement is met, the card upgrade bar at the bottom of each card turns green in color. Tap that card and press the golden “upgrade button”. You will need credits to upgrade a card. You can receive credits from free, victory and play packs. You will also get credits after winning a battle. You receive player XP when you upgrade a card. The XP you collect fills the player level bar located at the upper-left corner of the screen. When full, you level up and your turret’s health/attack power as well as your shield generator health stats increases. When building a deck, avoid a high average energy cost. Powerful units will have a high energy cost and they might prove to be the best in battle. But a deck having more units that cost around 5-6 energy may make things difficult for you to manage your cards. You will spend half the energy by just deploying one unit. And then wait for the energy bar to fill before you can deploy another. Meanwhile, your opponent will keep deploying more units to attack your turrets. Keeping the average energy cost low by having a mix of high+ more low energy-consuming cards will ensure you keep deploying units at regular intervals and attack enemy turrets. To know more about energy and the energy bar, read the first section “Know Your Game Rules” of this game. Star Wars Force Arena’s Trade section lets you trade cards you won for new cards. You can trade cards once in every 6 hours. If you have got lots of common cards that you don’t need, you can trade them for a rare card. You can trade 10 unwanted cards you own for a rare card. You can trade duplicate cards for a rare card. And the best part about trading is that you don’t have to drag different cards onto the 10 empty slots. If you have plenty of duplicates of an original common card, then you can trade 10 duplicates of that card for a rare card. I had plenty of “Probe Droids” and “Sandtroopers”, which was traded for a Rebel Honor Guard. Question: In stats for a squad card are these the total stats for an entire squad/card or for each unit? This makes a huge difference in comparing relative strengths. If the unit count is 3 then do I multiply the stats by 3 to compare the total strength of the squad/card to other cards?